Whilst shopping, hopping and bopping around Rome, you might just want to stick a ball of fresh mozzarella in your basket. 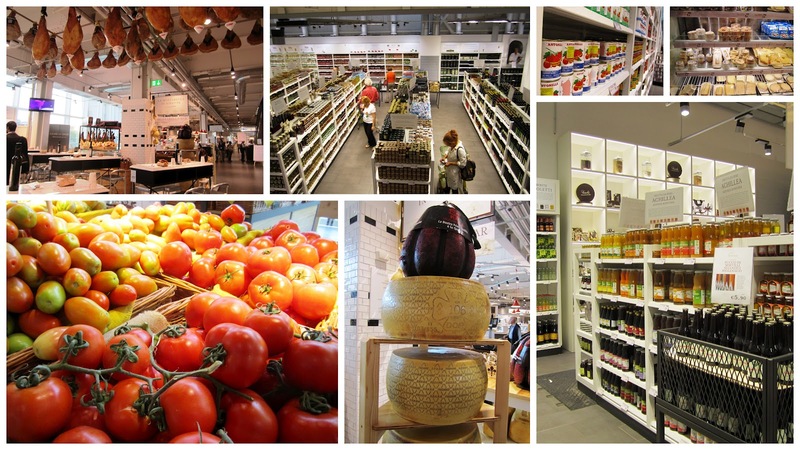 Enter the gates of Eataly, the largest outlet dedicated to Italian food in the world, and you are in foodie paradise. You wait your whole life for a shop like this, and three come along at once. New York, Tokyo and Rome. “Mangia bene, vivi meglio!” (Eat well, live better!) is Eataly’s motto. The essential Italian mantra that eating well leads to a better life, is celebrated. A haven of old school, divine Italian brand names of edible goodies. Olive oils, preserves, honeys, fruits, cheeses, breads, coffees, wines, chocolates and pastas. 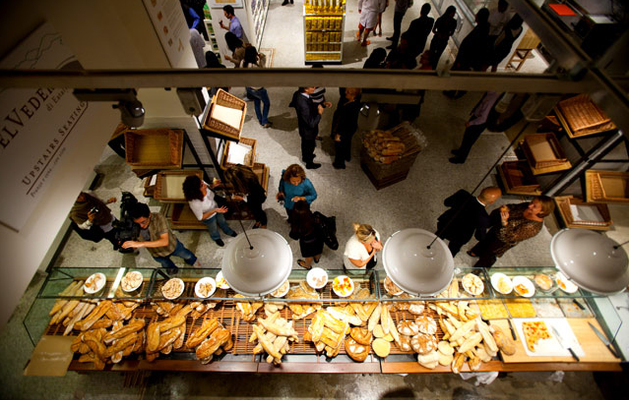 Eataly is the brainchild of Oscar Farinetti. An 80 million euro investment transformed Rome’s Ostiense train station into a food court spanning 17,000 square metres over four floors, selling seasonal, local, top notch Italian products. A Fortnum and Mason, of sorts. Following the success of Eataly stores in New York and across Japan, it was time to bring Italy to Italy, so to speak. Farinetti’s inspiration for Eataly are the bazaar’s of Istanbul, where one can mingle amidst dozens of food stalls, dowsed in expertise. A tour for the taste buds. Whether you choose to browse or devour, it’s a giant mercatino with experts at your fingertips. Eataly holds the largest bakery in Rome. From Bologna to Torino to Rome, the Eataly empire is expanding, but your waistline doesn’t have to. Farinetti believes we should spend less money on dresses and more on food, that we are too conscious of what we put on our body, than in it. Eat, learn, shop! Education is the key here, as they sell recipe books, and chart wheels on what products you can find in which season, such as fruit and fish. Eataly aims to teach children about the story of food in its varying regions of Italy. For example there is a restaurant on the top floor that changes chef and region every six weeks. Diversity keeps this project fresh, as there will always be a new and exciting flavor to savor for your next trip. Artisanal, regional, sustainable. Focusing on the slow food movement, Eataly sells different types of pasta from every region, handmade on site by the Michelis family (Edigio Michelis and his two sons and one daughter) who have been in business since 1919. Cheeses from all over Italy, under one roof, where you can nibble away, learn about wines, buy them and take them home and feast on them. Specially appointed food experts guarantee this project is a success. Nando Fiorentini. The main man in charge of fish, is a fisherman with 20 years experience chooses which fish to put on the menu there after his fishing expeditions at Fiumicino Anzio and Gaeta. Macelleria (butcher) Sergio Capaldo (director of the La Granda Consortium, a slow food movement in Piedemonte) is the supervisor of all the meat departments at Eataly. There is a Rosticceria and also a Paninoteca station selling panini and piadini. "Welcome to the biggest place in the world dedicated to Italian food. 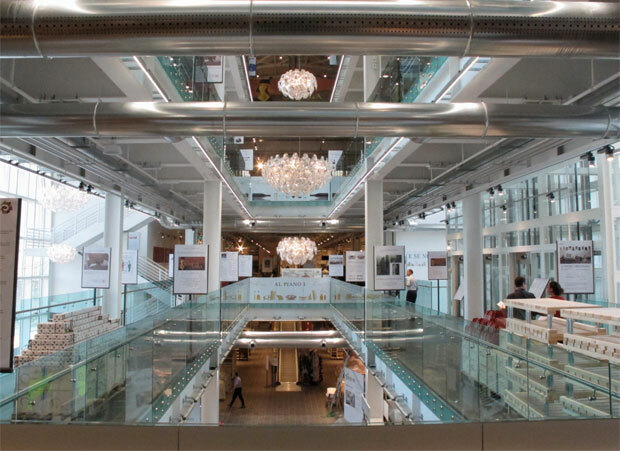 Our aim is to make it the third most visited place after the Colosseum and the Vatican Museums," said Eataly owner Oscar Farinetti. Farinetti is in love with food, but also with the planet. Biodegradability is key. ‘Save the planet’. In New York’s Eataly, you can ask them to peel your vegetables for you, whilst you shop. Vegetable peels are saved, to be used for compost. Ostiense neighbourghood of Rome, a stones throw from Testaccio. Location and aesthetically speaking, each Eataly project has breathed new life into old buildings by regenerating unwanted architectural projects of yesteryear. Eataly Torino was an old Vermouth factory. Eataly Bolgona makes use of a derelict cinema. Carlo Piglione, Eataly Rome architect, makes the most of the abandoned ex air terminal, originally designed by Spanish architect Julio Lafuente for the Soccer World Cup in 1990. Piglione redesigned the interior and added a sprinkling of decadence by the adding chandeliers made of Italy coffee cups at the Grand Bar Illy. For the foyer wow factor there is a modern art installation proudly displaying 20 dishes from 20 regions of Italy. Kartell Louis Ghost chairs, designed by Philip Starke, seat 1588 people. 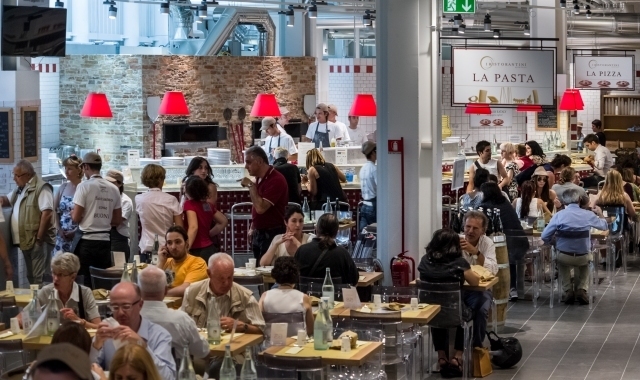 Eataly are aiming for 4’000 diners daily to eat at the various restaurants at Eataly Rome. The Champagne and Oysters bar is a must! Will power. It’s a tough one. From Luca Montersino’s pasticceria station at Eataly to the Cioccolateria Venchi. Put that in your cake and eat it. This really is temptation at its darkest hour. Rome’s Eataly is the their largest of 19 Eataly branches to date, and the largest place in the world dedicated to Italian food. A temple, if you will.